It has happened to all of us before, a nice buck is almost within striking distance, he pauses, your eyes lock for a few seconds, and then he bolts. Was it your movement? A noise? A scent? Does the UV in your clothing make you glow like a light bulb? Many of us go to great measures to avoid detection by deer. The first thing that comes to mind for most of us is camouflage. But how effective is the method? First, you need to understand how a deer eye performs. A deer eye, much like a human eye is made up of rods and cones. If we can remember back for a moment, to our high school biology class, we know that rods are sensitive to light, while cones pick up color. The difference between a human eye and a deer eye is the number of rods versus the number of cones. Deer have more rods and fewer cones than a human; therefore, deer have much better low light vision, but they do not distinguish between colors as well as a human. Deer also have a pupil that opens wider than ours which allows more light in for improved night vision. Another major difference is that deer lack the UV filtration that human eyes have. Humans have a protective filter on their eyes that block up to 99% of UV rays. Because of this we are able to focus more sharply on fine details, this however limits humans sensitivity to shortwave lengths, mainly those in the UV spectrum. Without this filter deer are limited by their ability to see fine details, as a result however, they have a better view of the UV spectrum. Humans eyes can only see light in the “Visible Spectrum”, this consist of red, orange, yellow, green, blue and violet. Beyond violet light in the visible spectrum is what is known as ultraviolet light in the "UV Spectrum", light that is invisible to the human eye. We can see the effects of ultra violet light only by using a black light to give us an idea of how a deer might perceive certain surroundings. This is the reason manufactures are now making a special UV eliminating spray for clothing. Clothing and laundry detergent manufactures add UV brighteners, or more specifically, phosphors to clothing to make them appear more colorful and bright. This technique is most noticeable in white clothing; you will notice that new white clothing looks whiter than it should in full sun. Deer lack the cone that is responsible for red color (long wave lengths). 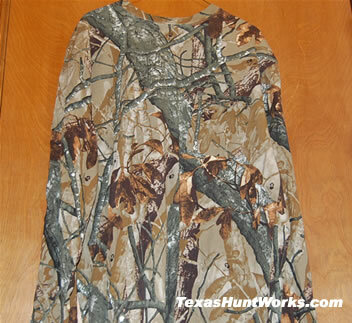 Therefore, it is safe to say that wearing such colors as Red and Orange do not affect a hunters ability to remain hidden from a deer's vision. 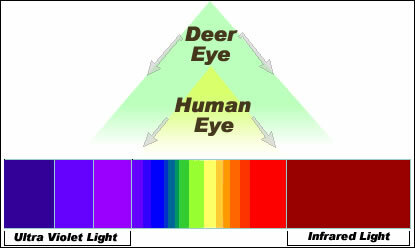 This does not mean that deer don’t see these colors, they are just perceived differently. A deer’s vision is limited to short blue and middle green wave lengths. “This means that deer can distinguish blue from red, but not green from red or orange from red”. According to this data, it is safe to say that blue colors are the worst to wear for camouflage and that green, red and orange are safe to wear from a camouflage stand point. 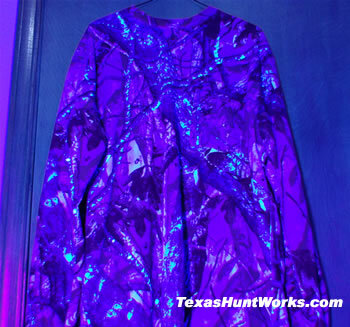 This study also found that deer are capable of seeing UV dyes and brighteners within fabrics. This study was unable to determine how bright these colors appear to the deer. Keep in mind that the UV factor will only be of concern during low light hours. Unfortunately, this is when deer are most active. 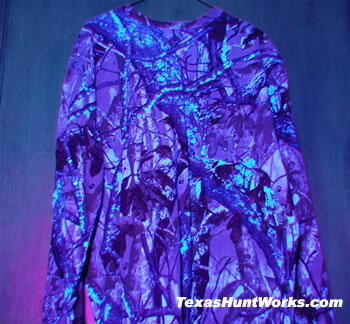 In our test, we used a brand new camo shirt, placed it in a room accented with low natural light and took pictures under a black light. The first picture simply shows the shirt under normal light as we would normally see the shirt. The second picture shows the same shirt under a black light. Notice with this particular shirt, it doesn’t appear to contain any UV illuminating material in its brand new state. The third picture was taken after one wash with a standard laundry detergent. 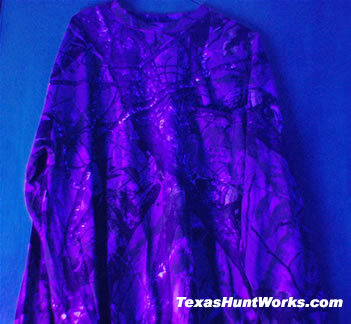 You will notice that the shirt appears to have a slight glow and is a little bit lighter under the black light than it was before the wash. The forth picture of the shirt is after a second wash. You will notice that the shirt appears much brighter than it did after the first wash. Looking at this shirt under a black light shows us a dramatic difference and is enough cause alarm for those of us who want to make sure that we have done everything possible to remain hidden from view. And finally the fifth picture, which has been treated with a UV eliminating spary. The right side of the shirt is obviously the side with the UV eliminating spray. But the question still remains, how much UV do deer see and do they see more or less of what we can see under a black light. In conclusion, should we dress in camouflage clothing? Yes. Does it have to be the latest and greatest pattern? Probably not. As long as you do not wear clothing that is a solid color you should be fine. In fact according to the data above, a red plaid flannel shirt should keep you just as camouflaged as some of the pricier camouflage patterned shirts currently available. 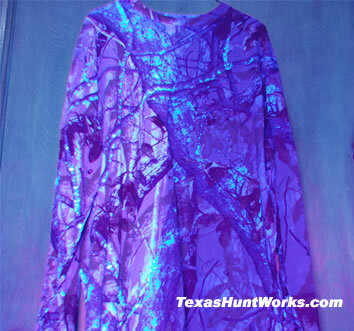 As far as the UV goes, our clothing definitely contains UV illuminating material unless treated. But how much of a factor this is still up for debate. To me, I would pay an extra $12 - $15 for the UV eliminating treatment and know its one less thing to worry about.